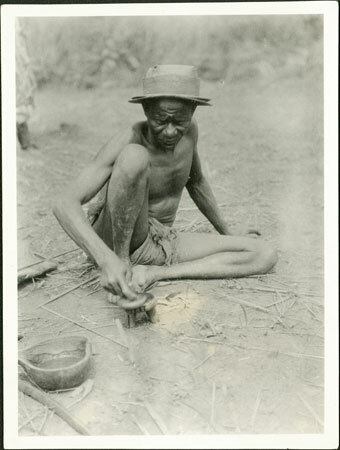 A man (identified as Windis or Zori, a subject of Gami the commoner governor) sitting on the ground within a homestead, operating an iwa (rubbing-board) oracle. A gourd dish containing water used for wetting the lid of the rubbing board sits alongside. Morton, Chris. "Consulting the Zande iwa oracle" Southern Sudan Project (in development). 03 Jan. 2006. Pitt Rivers Museum. <http://southernsudan.prm.ox.ac.uk/details/1998.341.238.2/>.